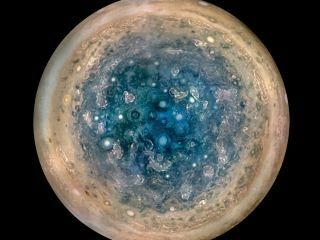 Researchers have spotted Jupiter's southern X-ray aurora for the first time, revealing that it moves and pulses out of sync with the gas giant's northern lights. Here, Jupiter's south pole can be seen from an altitude of 32,000 miles (52,000 km) as imaged by NASA's Juno spacecraft. Astronomers have finally detected X-rays blazing from Jupiter's mysterious southern lights, a new study finds. Unexpectedly, the giant planet's northern and southern lights do not pulse in time with each other, but beat out of sync, according to the new work. This finding raises questions about how these auroras are generated, the researchers said. Jupiter's giant magnetic field is the strongest of all the planets in the solar system, at nearly 20,000 times the strength of Earth's, and the gas giant's auroras are similarly powerful and especially bright in X-rays. "It is really an entirely different, vaster, more energetic world," said study lead author William Dunn, an astrophysicist at University College London. While a stream of charged particles from the sun generates Earth's rippling auroras, Jupiter can produce its own auroras, without the solar wind. "Jupiter has this tiny moon called Io, which is the most volcanic body in the solar system and fills Jupiter's space environment with sulfur, oxygen and other material at 1 ton per second," Dunn told Space.com. This material from Io can interact with Jupiter to generate auroras. As researchers examined Jupiter, much remained uncertain about how the X-rays seen in the planet's northern lights were produced, Dunn said. To generate the specific colors of X-rays seen in those auroras, the planet needs to accelerate oxygen ions to a speed of about 3,000 miles (5,000 kilometers) per second. This is fast enough for all the electrons to get torn off the oxygen ions when they crash into Jupiter's atmosphere, thus emitting the kinds of X-rays that scientists have detected, he said. This image of auroras on Jupiter is a composite of ultraviolet observations by the Hubble Space Telescope taken in 2016 and a visible light image of the planet taken in 2014. To learn more about how Jupiter generates its northern X-ray auroras, scientists wanted to compare those lights with the planet's southern X-ray auroras. However, until now, researchers had seen X-ray auroras only in the planet's northern lights. Using data collected by the XMM-Newton and Chandra X-ray space observatories in 2007 and 2016, the scientists produced maps of Jupiter's X-ray emissions and identified an X-ray hotspot at each pole. Each hotspot covered an area much wider across than Earth. The very high-energy X-ray emissions at Jupiter's south pole consistently pulsed every 11 minutes, while those at the north pole erratically increased and decreased in brightness, acting independently of the south pole. These results were extremely surprising, Dunn said, and not predicted by current models of how Jupiter's auroras are generated. "I had to quadruple-check everything and ask some of my colleagues to do this, too, to ensure that I hadn't made any mistakes," Dunn said. "I think one of the coolest things about working in science is those moments where you realize you're the first human in all of human history to have seen a new aspect of nature. I think that buzz of discovery is one of many, many reasons that I am an astrophysicist." There were two complementary ideas for how Jupiter generated its X-ray auroras, Dunn said. The first was that Jupiter produced huge electrical currents to keep the electrically charged particles around the planet rotating at the same speed that the gas giant spins. "Just like electric circuits that you might study in school, the flow of current out from the planet has to return to the planet somewhere to complete the circuit," Dunn said. "This is expected to return to the planet from huge distances [of] 6 million km [3.7 million miles] away. Over these great distances, you would produce huge voltages — 8 megavolts, tens of thousands of times more voltage than is in your house. These voltages accelerate the particles very fast, fast enough to tear all the electrons off of oxygen when it hits the atmosphere." The second idea was that part of this returning electrical current was perturbed by interactions between the solar wind and Jupiter's magnetosphere, the area of space dominated by Jupiter's magnetic field and captured electrically charged particles. These interactions could lead to "bursts of particles accelerated very fast into Jupiter's atmosphere, to produce bursts of bright emission," Dunn said. However, each of these ideas fails to explain why the auroras at Jupiter's poles act independently of one another. One possible explanation is that conditions in Jupiter's magnetosphere can shift quickly, such that whatever influences one pole may not have the same effect whenever it reaches the other pole, the researchers said. Another possibility is that the two poles differ somehow in their general activity, the scientists added. The researchers said NASA's Juno spacecraft, currently orbiting Jupiter, should collect data that will help solve the mystery of the giant planet's auroras. "NASA's Juno mission started undertaking these daredevil flights of Jupiter about a year ago and is really rewriting so much of what we thought we knew about the planet, while uncovering so many things that we hadn't even conceived of," Dunn said. He noted that only two weeks ago, Juno's JEDI instrument "announced the discovery of huge electric fields that undoubtedly play an important role in the X-ray aurora. "Inevitably, some of the ideas we have proposed will be wrong. This is the nature of doing science — you propose an idea and then test it," Dunn said. "I'll be just as happy if we're proven wrong on some of these ideas if it gets us a little closer to the right answer or provokes some discussion that gets rid of a few more of the wrong answers." The scientists detailed their findings online Oct. 30 in the journal Nature Astronomy.